Arrhythmia & Electrophysiology Review 2018;7(4):ePub: 29 September 2018. Liang JJ, Muser D, Santangeli P. Ventricular tachycardia ablation clinical trials. Card Electrophysiol Clin 2017;9:153–65. https://doi.org/10.1016/j.ccep.2016.10.012; PMID: 28167083. Santangeli P, Muser D, Maeda S, et al. Comparative effectiveness of antiarrhythmic drugs and catheter ablation for the prevention of recurrent ventricular tachycardia in patients with implantable cardioverter-defibrillators: a systematic review and meta-analysis of randomized controlled trials. Heart Rhythm 2016;13:1552–9. https://doi.org/10.1016/j.hrthm.2016.03.004; PMID: 26961297. Liang JJ, Santangeli P, Callans DJ. Long-term outcomes of ventricular tachycardia ablation in different types of structural heart disease. Arrhythm Electrophysiol Rev. 2015;4:177–83. https://doi.org/10.15420/aer.2015.4.3.177; PMID: 26835122. Sapp JL, Wells GA, Parkash R, et al. Ventricular tachycardia ablation versus escalation of antiarrhythmic drugs. N Engl J Med 2016;375:111–21. https://doi.org/10.1056/NEJMoa1513614; PMID: 27149033. Saxon LA, Bristow MR, Boehmer J et al. Predictors of sudden cardiac death and appropriate shock in the Comparison of Medical Therapy, Pacing, and Defibrillation in Heart Failure (COMPANION) trial. Circulation 2006;114:2766–72. https://doi.org/10.1161/CIRCULATIONAHA.106.642892; PMID: 17159063. Santangeli P, Muser D, Zado ES, et al. Acute hemodynamic decompensation during catheter ablation of scar-related ventricular tachycardia: incidence, predictors, and impact on mortality. Circ Arrhythm Electrophysiol 2015;8:68–75. https://doi.org/10.1161/CIRCEP.114.002155; PMID: 25491601. Santangeli P, Frankel DS, Tung R, et al. Early mortality after catheter ablation of ventricular tachycardia in patients with structural heart disease. J Am Coll Cardiol 2017;69:2105–15. https://doi.org/10.1016/j.jacc.2017.02.044; PMID: 28449770. Muser D, Mendelson T, Fahed J, et al. Impact of timing of recurrence following catheter ablation of scar-related ventricular tachycardia on subsequent mortality. Pacing Clin Electrophysiol PACE 2017;40:1010–16. https://doi.org/10.1111/pace.13149; PMID: 28744864. Muser D, Santangeli P, Castro SA, et al. Long-term outcome after catheter ablation of ventricular tachycardia in patients with nonischemic dilated cardiomyopathy. Circ Arrhythm Electrophysiol 2016;9:e004328. https://doi.org/10.1016/j.jacep.2017.11.021; PMID: 30089558. Mathuria N, Wu G, Rojas-Delgado F, et al. Outcomes of pre-emptive and rescue use of percutaneous left ventricular assist device in patients with structural heart disease undergoing catheter ablation of ventricular tachycardia. J Interv Card Electrophysiol Int J Arrhythm Pacing 2017;48:27–34. https://doi.org/10.1007/s10840-016-0168-8; PMID: 27497847. Sadek MM, Schaller RD, Supple GE, et al. Ventricular tachycardia ablation – the right approach for the right patient. Arrhythm Electrophysiol Rev 2014;3:161–7. https://doi.org/10.15420/aer.2014.3.3.161; PMID: 26835085. Santangeli P, Rame JE, Birati EY, Marchlinski FE. Management of ventricular arrhythmias in patients with advanced heart failure. J Am Coll Cardiol 2017;69:1842–60. https://doi.org/10.1016/j.jacc.2017.01.047; PMID: 28385314. Miller MA, Dukkipati SR, Chinitz JS, et al. Percutaneous hemodynamic support with Impella 2.5 during scar-related ventricular tachycardia ablation (PERMIT 1). Circ Arrhythm Electrophysiol 2013;6:151–9. https://doi.org/10.1161/CIRCEP.112.975888; PMID: 23255277. Miller MA, Dukkipati SR, Mittnacht AJ, et al. Activation and entrainment mapping of hemodynamically unstable ventricular tachycardia using a percutaneous left ventricular assist device. J Am Coll Cardiol 2011;58:1363–71. 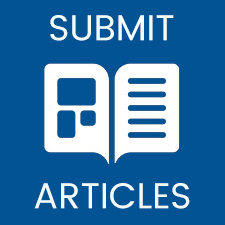 https://doi.org/10.1016/j.jacc.2011.06.022; PMID: 21920266. Koutalas E, Rolf S, Dinov B, et al. Contemporary mapping techniques of complex cardiac arrhythmias – identifying and modifying the arrhythmogenic substrate. Arrhythm Electrophysiol Rev. 2015;4:19–27. https://doi.org/10.15420/aer.2015.4.1.19; PMID: 26835095. Reddy YM, Chinitz L, Mansour M, et al. Percutaneous left ventricular assist devices in ventricular tachycardia ablation: multicenter experience. Circ Arrhythm Electrophysiol 2014;7: 244–50. https://doi.org/10.1161/CIRCEP.113.000548; PMID: 24532564. Aryana A, Gearoid O’Neill P, Gregory D, et al. Procedural and clinical outcomes after catheter ablation of unstable ventricular tachycardia supported by a percutaneous left ventricular assist device. Heart Rhythm 2014;11:1122–30. https://doi.org/10.1016/j.hrthm.2014.04.018; PMID: 24732372. Kusa S, Miller MA, Whang W, et al. Outcomes of ventricular tachycardia ablation using percutaneous left ventricular assist devices. Circ Arrhythm Electrophysiol 2017;10:pii:e004717. https://doi.org/10.1161/CIRCEP.116.004717; PMID: 28576780. Enriquez A, Liang J, Gentile J, et al. Outcomes of rescue cardiopulmonary support for periprocedural acute hemodynamic decompensation in patients undergoing catheter ablation of electrical storm. Heart Rhythm 2018; 15:75–80. https://doi.org/10.1016/j.hrthm.2017.09.005; PMID: 28917560. Muser D, Liang JJ, Castro SA, et al. 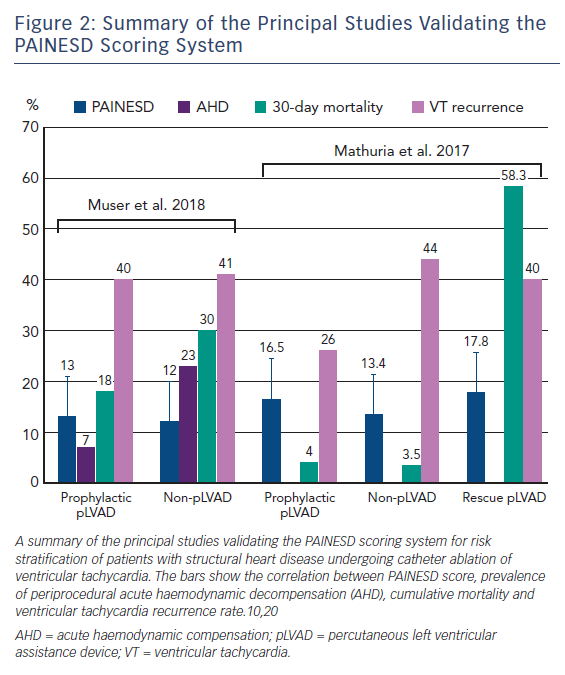 Outcomes with prophylactic use of percutaneous left ventricular assist devices in high-risk patients undergoing catheter ablation of scar-related VT: a propensity-matched analysis. Heart Rhythm 2018. https://doi.org/10.1016/j.hrthm.2018.04.028; PMID: 29753944; epub ahead of press. Njeim M, Bogun F. Selecting the appropriate ablation strategy: the role of endocardial and/or epicardial access. Arrhythm Electrophysiol Rev 2015;4:184–8. https://doi.org/10.15420/aer.2015.4.3.184; PMID: 26835123. Naidu SS. 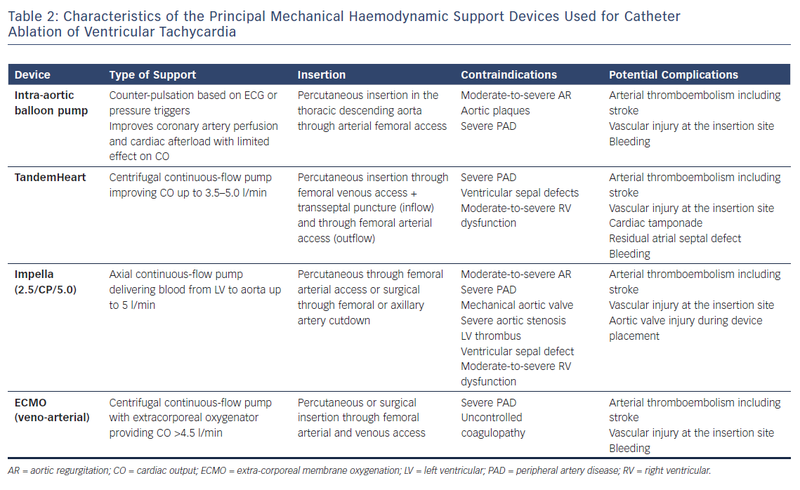 Novel percutaneous cardiac assist devices: the science of and indications for hemodynamic support. Circulation 2011;123:533–43. 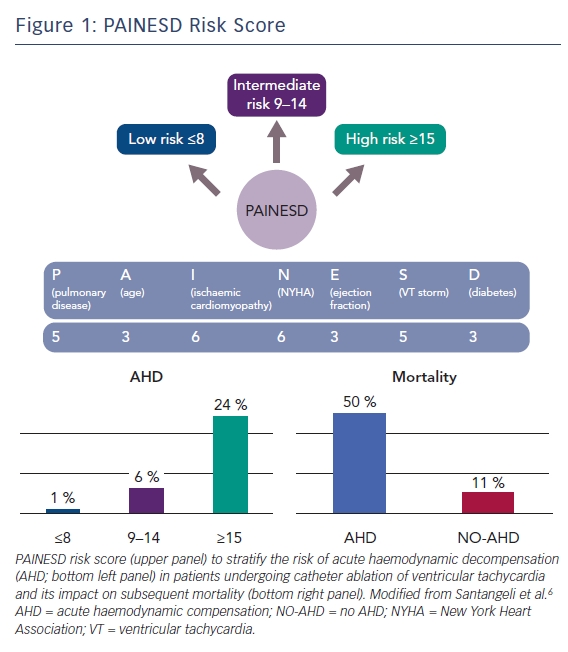 https://doi.org/10.1161/CIRCULATIONAHA.110.945055; PMID: 21300961. Carbucicchio C, Bella PD, Fassini G, et al. 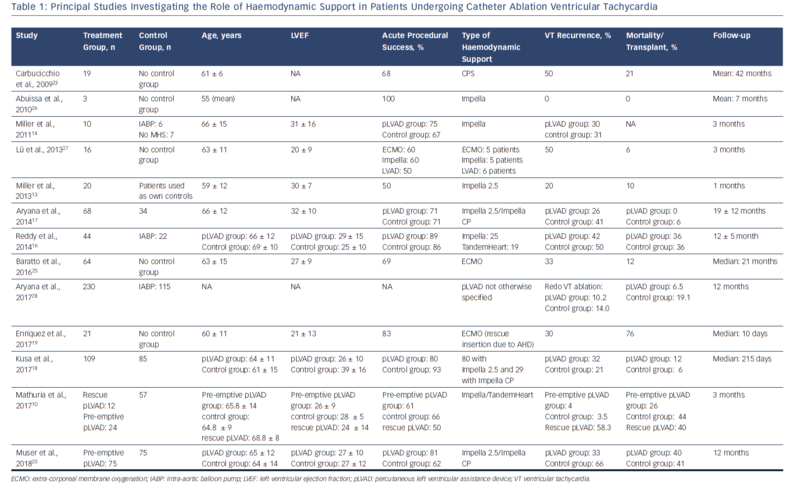 Percutaneous cardiopulmonary support for catheter ablation of unstable ventricular arrhythmias in high-risk patients. Herz 2009;34:545–52. https://doi.org/10.1007/s00059-009-3289-3; PMID: 20091254.
von Segesser LK. Cardiopulmonary support and extracorporeal membrane oxygenation for cardiac assist. Ann Thorac Surg 1999;68:672–7. https://doi.org/10.1016/S0003-4975(99)00543-3; PMID: 10475469. Baratto F, Pappalardo F, Oloriz T, et al. Extracorporeal membrane oxygenation for hemodynamic support of ventricular tachycardia ablation. Circ Arrhythm Electrophysiol 2016;9:pii:e004492. https://doi.org/10.1161/CIRCEP.116.004492; PMID: 27932426. Abuissa H, Roshan J, Lim B, Asirvatham SJ. Use of the Impella microaxial blood pump for ablation of hemodynamically unstable ventricular tachycardia. J Cardiovasc Electrophysiol 2010;21:458–61. https://doi.org/10.1111/j.1540-8167.2009.01673.x; PMID: 20039989. Lü F, Eckman PM, Liao KK, et al. Catheter ablation of hemodynamically unstable ventricular tachycardia with mechanical circulatory support. Int J Cardiol 2013;168:3859–65. https://doi.org/10.1016/j.ijcard.2013.06.035; PMID: 23863501. Aryana A, d’Avila A, Cool CL, et al. Outcomes of catheter ablation of ventricular tachycardia with mechanical hemodynamic support: an analysis of the Medicare database. J Cardiovasc Electrophysiol 2017;28:1295–302; http://doi.wiley.com/10.1111/jce.13312; PMID: 28800178.